Before there was The Lens, there was the blog “Squandered Heritage.” And before there was a newsroom staff, there was Karen Gadbois reporting on land use and government accountability. On April 25, The Lens celebrated its eighth anniversary with a nod to its past and a conversation about how The Lens became what it is today. 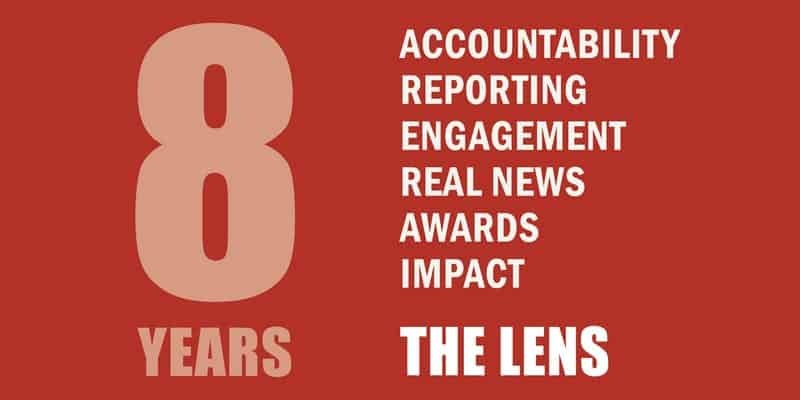 The Lens is a nonprofit newsroom dedicated to in-depth reporting. It has nearly seven years’ experience producing investigative reporting in the public interest that gets results. Unlike many media outlets, The Lens primarily measures its value and worth to its readers and supporters by tracking the changes it has helped create in its community. That’s because its mission is to empower readers with the information they need to advocate for a more just and accountable governance. The conversation highlighted how a quest for government accountability led Gadbois to establish The Lens with Ariella Cohen. Topics for discussion included uncovering government misconduct, earning a Peabody Award and inspiring a character on HBO’s Treme, and, of course, how her efforts led to the creation of a nonprofit, investigative newsroom we now know as The Lens. Participants enjoyed a glass of wine from 6pm to 7pm while they got to know members of The Lens staff and board, as well as other readers and supporters. At 7pm, they offered the history of The Lens through a live interview of Lens Founder Karen Gadbois. The celebration was free and open to the public. The Lens team thanks their sponsors PEN America, LCI Workers’ Comp, Propeller Incubator, and 89.9 WWNO for making this event possible.